The mechanism of the ALS toxic set is seen in this diagram. 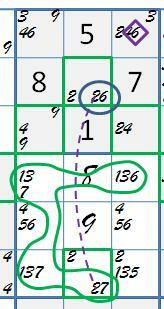 The ovals represent two ALS, with candidates of at least two numbers in both sets that see each other. For one number c, all candidates in the two ALS see each other. The set of c-candidates is called the restricted common. There is only one true c-candidate. Since the ALS do not intersect, only one can contain this true c-candidate. The other must give up c in the solution. An ALS can give up only one number, and then becomes locked. If there is a restricted common, one of member of the ALS pair will be locked, containing a true candidate of all its other numbers. Any z-candidate outside of the ALS pair, that sees all of the pair’s z-candidates, can be removed. It sees the z-candidates of the locked ALS, and therefore, it sees the true c-candidate. Naturally, the more candidates there are in a toxic set, the fewer removals it generates. The most effective ALS pairs have only one z-candidate in each member. Also, the fewer the candidates X in each ALS, the more frequently they all see each other and become a restricted common. By far the easiest toxic ALS pair to spot is one with a bv as one of its ALS. Megastar’s Sudoku Maestro 8-9 of Fall 2009 illustrated ALS toxic sets with the following four, found in succession. French Sudokuers call the technique ”L’attaque du cobra”. The full puzzle will be revealed shortly. Megastar’s keypad marking is replaced by slink marking. The ALS pairs are marked by blue and green ovals around candidates in each cell, leaving out extra slink marking copies. The restricted commons are drawn in purple dashed curves, and toxic set removal diamonds are in purple. In the first two examples, a bv is paired with a row ALS having single candidates as restricted common. In the third, one ALS is defined within a box. The fourth illustrates another type of restricted common. You are reading an update from 2015. Four years later, I must admit to being in the dark about how to spot the ALS pairings we see in these examples. I finally caught on, and will be reporting on a practical method in the updated next post. Interestingly, the puzzle generating the four toxic ALS pairs above does not make it to ALS toxic sets in the SOB. You might like to test your sysudokie skills and find out where it falls. 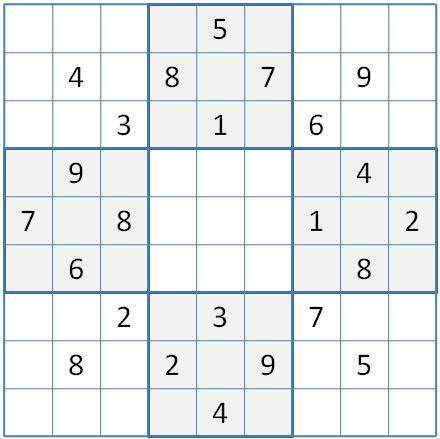 Next post will checkpoint through basic solving. So what happens then two number groups of an ALS pair mutually see each other, i.e. the pair have two commons. Then each ALS gets one of the two common numbers, and both are otherwise locked. All candidates of other shared numbers are toxic sets. Hodoku’s Hobiger calls this a doubly linked ALS. 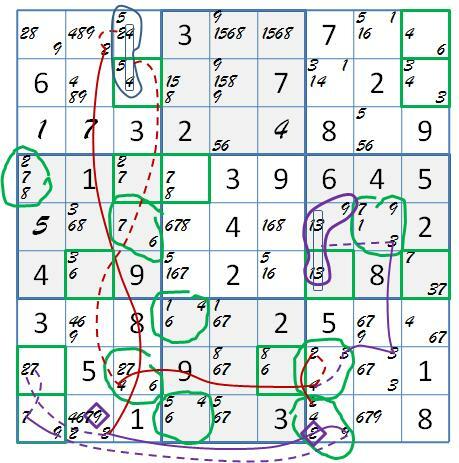 My friend Gordon Fick, found one in the “most difficult” puzzle 200 of Antoine Alary’s More Extreme Sudoku, as reported in my post of May 5, 2015. Gordon extended the toxic set finding removals that occur regardless of which of the two ways that the ALS could claim the two common numbers. ALS toxic set removals may be discovered at any time, but I place a concentrated search for them very late in the Systematic Sudoku Order of Battle. This is because there is a surprisingly large number of ALS to process in a typical puzzle. Finding and evaluating all toxic sets is a time consuming, and a somewhat clerical task. I had left the previous chain there in case parts of it remained useful. I was beginning to bring in additional ALS to explore extensions, when this little beauty popped out. This entry was posted in Advanced Solving and tagged almost locked set, ALS, ALS toxic set. Bookmark the permalink.